The One Hundred Second United States Congress was a meeting of the legislative branch of the United States federal government, composed of the United States Senate and the United States House of Representatives. It met in Washington, DC from January 3, 1991, to January 3, 1993, during the last two years of the administration of U.S. President George H. W. Bush. The apportionment of seats in this House of Representatives was based on the 1980 United States Census. Both chambers had a Democratic majority. May 20, 1992: The House and the Senate each pass a concurrent resolution agreeing that the Twenty-seventh Amendment to the United States Constitution was validly ratified, despite the unorthodox period of more than 202 years for the completion of the task. 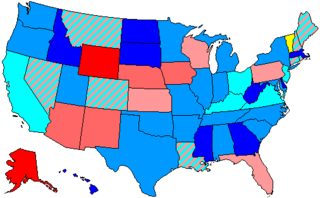 Senators are popularly elected statewide every two years, with one-third beginning new six-year terms with each Congress, In this Congress, Class 3 meant their term ended with this Congress, requiring reelection in 1992; Class 1 meant their term began in the last Congress, requiring reelection in 1994; and Class 2 meant their term began in this Congress, requiring reelection in 1996. (1) Pete Wilson (R) Resigned January 7, 1991, after being elected Governor of California. (1) John Heinz (R) Died April 4, 1991. (1) Quentin N. Burdick (D) Died. (1) Jocelyn Burdick (D) Interim appointee retired December 14, 1992. (3) Kent Conrad (D) Resigned December 14, 1992, to assume vacant Class 1 seat to which he was elected. (2) Al Gore (D) Resigned January 2, 1993, to become Vice President of the United States. ^ Dean, John W. (September 27, 2002). "The Telling Tale of the Twenty-Seventh Amendment". FindLaw. Retrieved July 9, 2013. 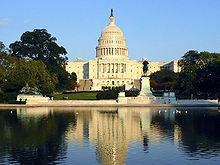 "Videos of House of Representatives Sessions for the 102nd Congress from www.C-SPAN.org". "Videos of Senate Sessions for the 102nd Congress from www.C-SPAN.org". "Videos of Committees from the House and Senate for the 102nd Congress from www.C-SPAN.org". House of Representatives Session Calendar for the 102nd Congress (PDF). Congressional Pictorial Directory for the 102nd Congress. Official Congressional Directory for the 102nd Congress.